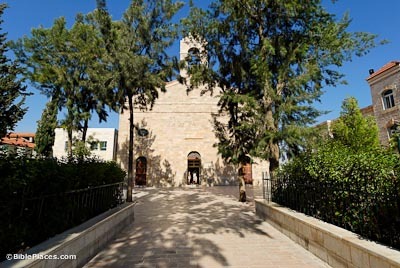 The modern Arab village of Medeba (Madaba) is built on the ruins of biblical Medeba. 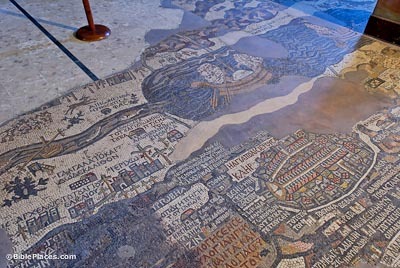 During construction of the Church of St. George, the beautiful “Madaba Map” was found. This map was originally part of the floor of a Byzantine church, built during the reign of emperor Justinian, AD 527-565. It is the oldest map of the Holy Land that is still extant. 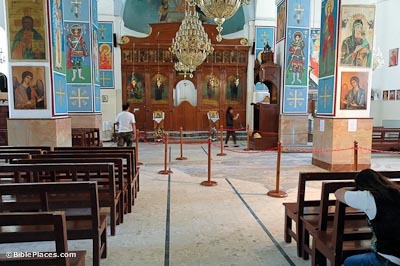 Five other Byzantine churches have been discovered in Madaba, all with nice mosaics. 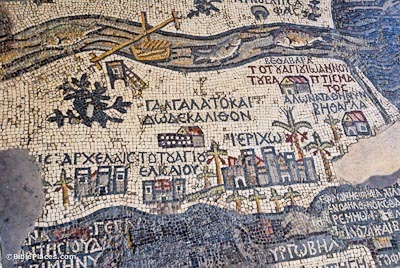 This has led to Madaba’s designation as “the city of mosaics.” Madaba is 20 miles (32 km) south of Jordan’s capital city of Amman. The map is in the center of the modern church, with the crowds gathered around it in the picture at right. The current remains are 34.5 ft x 16.5 ft (10.5 m x 5 m, but patchy and not entirely square), only about one-third the original size. There are currently 750,000 cubes remaining. The original size of the map was approximately 51 ft x 19.5 ft (15.5 m x 6 m), although no borders are visible. The map is made of various colors. It has 150 Greek inscriptions in various sizes, and covers the area from Tyre in the north to the Egyptian Delta in the south. 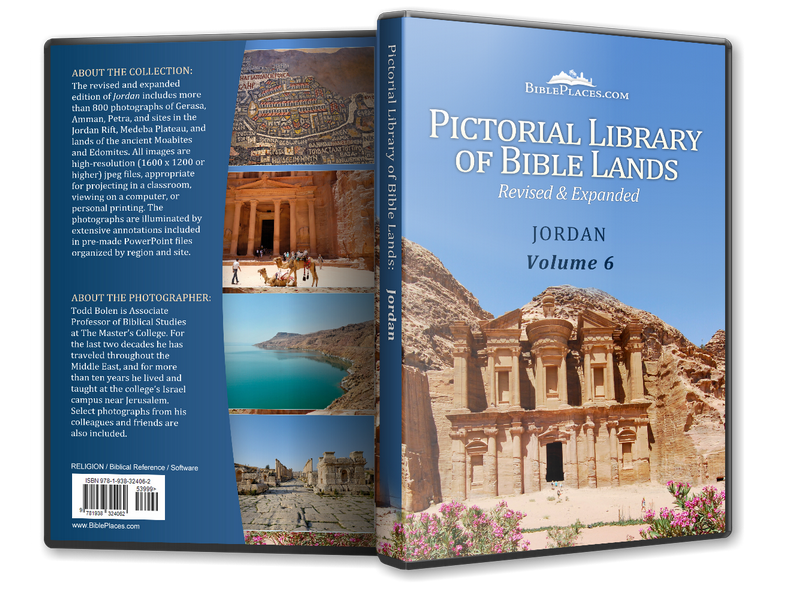 Most of the labels are in Cisjordan (modern Israel), and are concerned with Biblical locales, regional names, and events. For example, the map marks Jericho with palm trees, 12 stones at Gilgal, Jacob’s well in Shechem, tribal allotments, the Oak of Mamre at Hebron, John’s baptism of Jesus in the Jordan River, Benjamin, Judah, and Bethlehem. The map was restored in 1965 under the direction of H. Donner. The map has an east orientation (east is at the top) and was probably based on Eusebius’ Onomasticon (with some corrections) and road networks. It is interesting to note that there is no “tongue” (land mass) protruding in the Dead Sea; possibly there was a higher water level at this time. In the Jordan River, the fish are swimming away from the (deadly waters of the) sea, there is boat traffic, and on the banks are gazelles and lions. Walls are visible around the big cities, including Jerusalem, Jericho, and Ashdod. Jerusalem is the focus of the map. 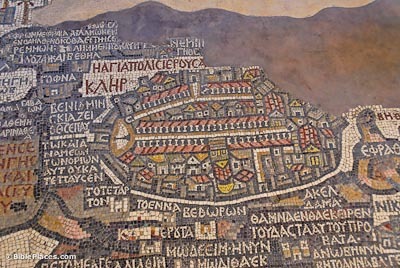 Clearly visible are the north-south Cardo and valley streets (lined with columns), the Damascus Gate plaza and pillar, the city walls, the Church of the Holy Sepulcher, the Church of Holy Zion (Hagia Sion), and Justinian’s “Nea” Church.